Any notion that Cue Card's resurgent display at Wetherby last month may have been a flash in the pan was completely blown out of the water with an awesome display in the Betfair Chase at Haydock. Colin Tizzard's pride and joy was one of the sport's big hitters a couple of seasons ago, with 2013 wins in the Ascot Chase, the Ryanair Chase and in this prestigious event confirming his place among the chasing elite. 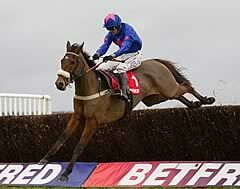 Sadly for him and his supporters, a lot of water has passed under the bridge since then and Cue Card was largely found wanting during the last campaign, and with the likes of Vautour, Coneygree and Don Cossack breathing new life into the division, it looked as though Tizzard's ace had had his day. However, with a wind operation over the summer appearing to have worked the oracle judged on the way he dominated his rivals in the Charlie Hall Chase, he was a well-supported 7-4 chance to deny old foe Silviniaco Conti (5-4 favourite) his third victory in the Merseyside showpiece. With a prep run over hurdles at Kempton under his belt, Silviniaco Conti looked tuned to the minute as he aimed to gallop his rivals silly under Noel Fehily. T he market leader attacked his fences with aplomb in attempt to get his opponents at work, but Cue Card was always in his wing mirrors under a confident Paddy Brennan. Fehily did his best to draw the finish out of his main rival from the home turn, but Cue Card was sitting pretty and the result was never in doubt after being sent clear. A bold leap at the last sealed a seven-length verdict, with Dynaste third ahead of Holywell and the tailed-off Ballynagour. William Hill cut Cue Card to 5-1 from 10-1 for the King George VI Chase, while he is 14-1 from 33s for the Cheltenham Gold Cup. An attempt to win all three, which would earn him a £1million bonus, is very much in Tizzard's mind. He said: "He's done it easier today (than two years ago). It was always going to happen, I thought. It's lovely to have him back. We've taken them all on and he's done it really well. We've had to deal with his problems and now he's back to his very best. "There's no reason to run away from Kempton. It's the next stop, I'd say. If he's in the form he's in now, the Gold Cup is the ultimate race, so why not?" Brennan, who won the Gold Cup aboard Imperial Commander five years ago, has no doubt Cue Card has what it takes to land the blue riband. "That was unbelievable. When I rode Imperial Commander I never thought I'd have the chance to sit on another horse as good or even a Gold Cup horse. The way he's done it out there today, he felt like a Gold Cup horse," said the jockey. Paul Nicholls, chasing his seventh Betfair Chase, had to make do with minor honours with Silviniaco Conti, but was gracious in defeat. He said: "Cue Card was very good and there are no excuses. He's run a nice race and they can't win every time. He jumped a little to the right and we might put the blinkers back on him next time as he races a bit lazily. I suppose we will go to Kempton next." Trainer David Pipe said of Dynaste and Ballynagour: "Dynaste ran well and we'll see how he comes out of the race before making any plans. The winner was very impressive. Ballynagour made a couple of mistakes and could not get into the race after that."